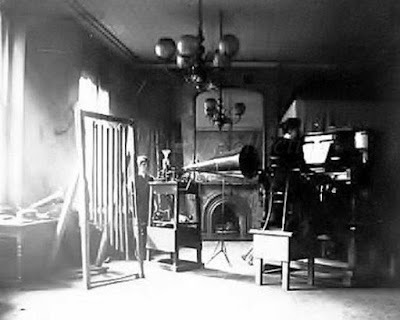 Possibly the first ever photograph of a ‘recording studio’. It was taken some time in 1898 at 31, Maiden Lane, London, where the Gramophone Co set up their first permanent recording room. You can see that the piano is raised so that its sound can be captured in the (one and only one!) recording horn which itself would be adjusted to the height of a singer’s mouth.